Balcony overlooking court. Nice architecture. Friendly staff. 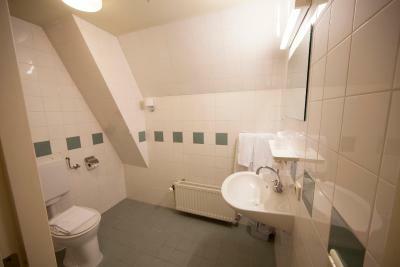 Great location near the city center with lots to see and do. Very nice breakfast buffet. - Stuff was very polite and helpful. 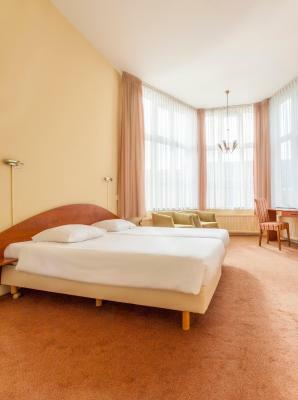 - The location was just great, couple minutes walking distance from the hear of the city. 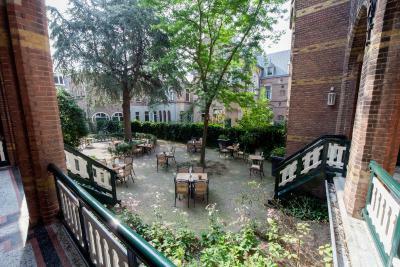 - The room had an adorable cozy balcony into the courtyard, perfect for a relaxing morning coffee. The location was perfect. 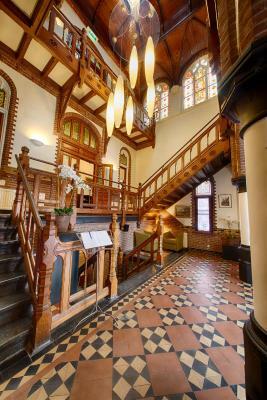 The hotel is located in a beautiful hystorical building. The staff was kind and attentive. Lovely friendly staff, hotel reception very historic, comfortable. Friendly staff members trying to make your stay as pleasant as possible. 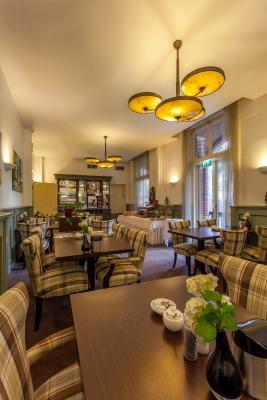 For me the Fletcher Hotel Gilde is the best choice for a short stay in Deventer. 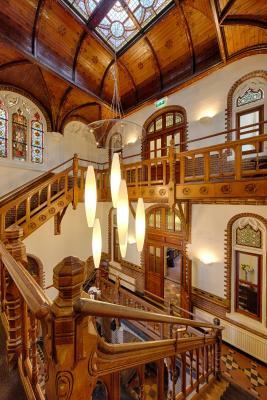 Beautiful building and stained glass windows - the best to be seen inside-out. In the centre of the city. Friendly staff. Healthy breakfast options. Quiet. 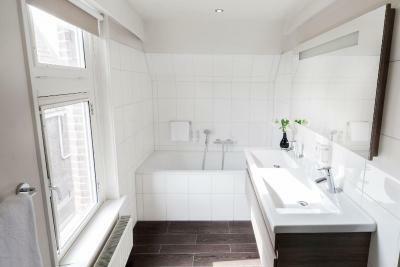 Clean and comfortable 1 person room. The bed was big enough and had a comfortable mattress. Tv reception is very good for a hotel. 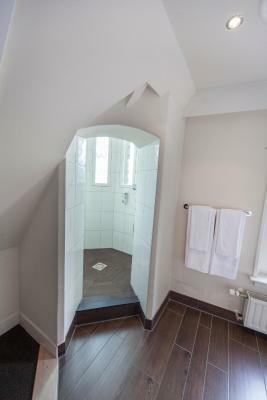 The shower is also fine. Helpfull staff and the location of the building is perfect. Bed comfortable. Staff friendly and helpful. 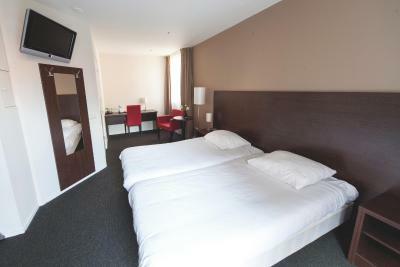 Good location near to shops and restuarants. Fletcher Hotel Gilde This rating is a reflection of how the property compares to the industry standard when it comes to price, facilities and services available. It's based on a self-evaluation by the property. Use this rating to help choose your stay! 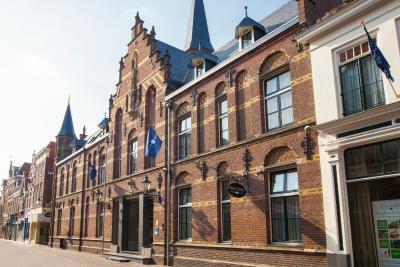 Fletcher Hotel Gilde is in a former rectory from 1751, just over a quarter mile from the main square in Deventer. 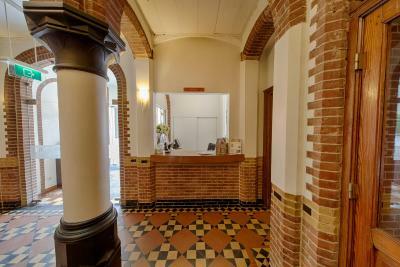 It includes a 24-hour front desk and original features such as stained glass. The rooms at Fletcher Hotel Gilde are unique due to the historic nature of this building. 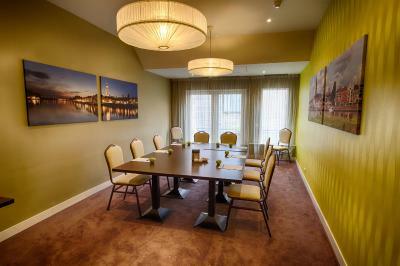 Each room includes a sitting area, work desk and TV. 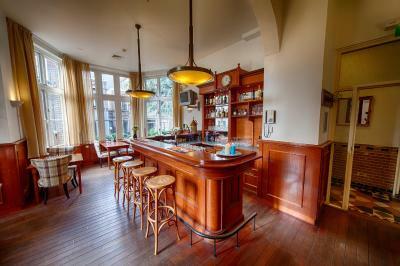 Guests can enjoy a drink in the cozy bar which includes high ceilings and a bay window. 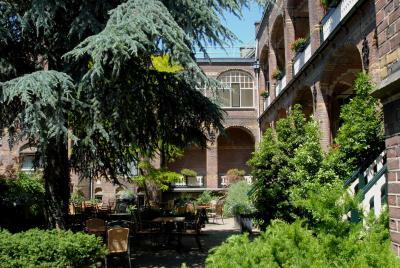 The hotel also has a very spacious garden courtyard with a peaceful terrace. 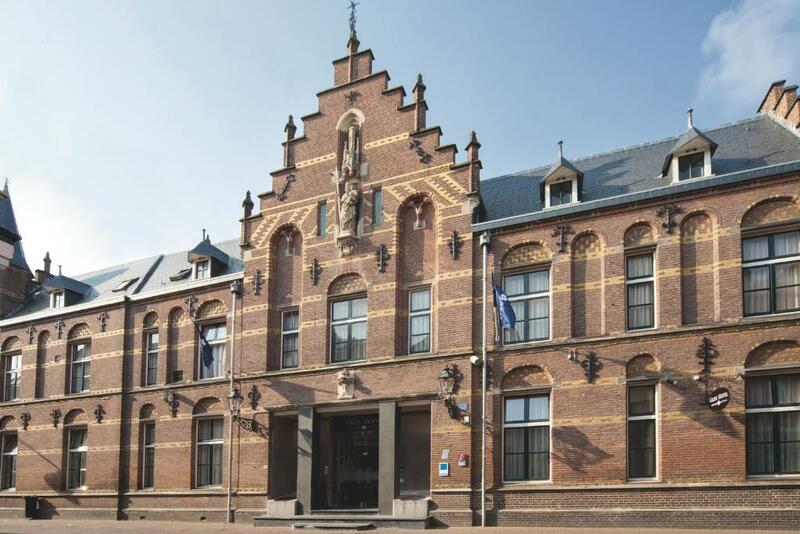 Fletcher Hotel Gilde is less than a 10 minute walk from the Historic Museum and the Deventer Schouwburg. 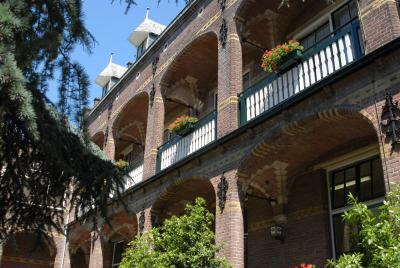 Apeldoorn, featuring sights including Apenheul Primate Park and Paleis Het Loo, is a 30 minute drive away. 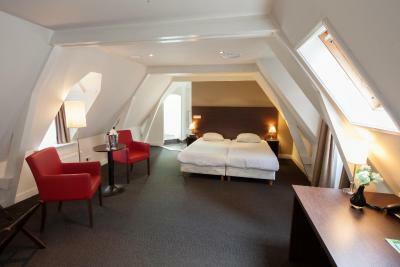 When would you like to stay at Fletcher Hotel Gilde? Some of these rooms have an original covered 19th-century balcony with a seating area. These rooms have a view over the courtyard. This room is elegantly decorated. Please note that extra beds cannot be added. 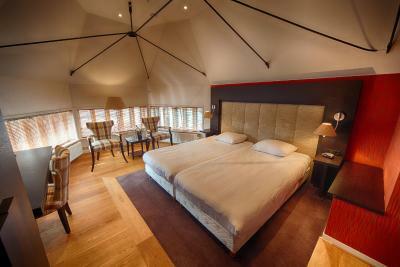 This spacious room includes an open-plan room with a kitchenette. 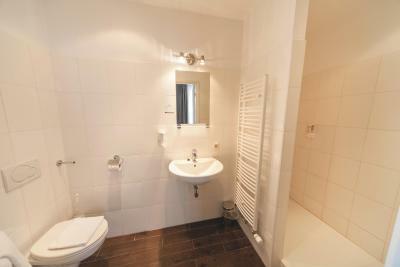 This room comes with a shower and/or bath, toilet, telephone, radio/TV and WiFi. 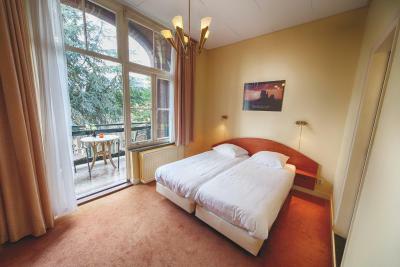 This Double Room comes with an original 19th century covered balcony with a seating area. 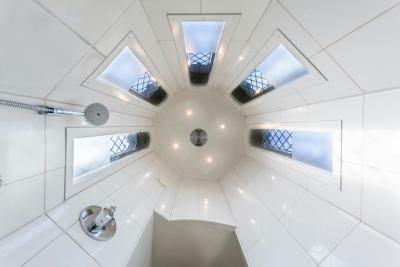 Extras include a phone, toilet, shower and/or bath, radio/TV and WiFi. Guests can enjoy courtyard view from the room. House Rules Fletcher Hotel Gilde takes special requests – add in the next step! 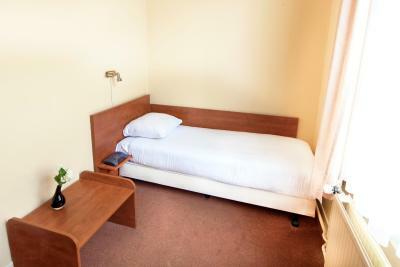 Up to two children under 4 years are charged EUR 10 per person per night in a crib. ATM card Fletcher Hotel Gilde accepts these cards and reserves the right to temporarily hold an amount prior to arrival. Fletcher Hotel Gilde accepts these cards and reserves the right to temporarily hold an amount prior to arrival. Please note that due to the fact that all of the rooms are different in size and design the photos may not accurately reflect all rooms. During shopping hours cars are not allowed in the center. Beds were not the best but may be ok to some people. Rooms dated but decent. The room was quite cold. The heaters were not working properly even though we set them on maximum. No tea/coffee options in the room. The shower curtain could use an update. 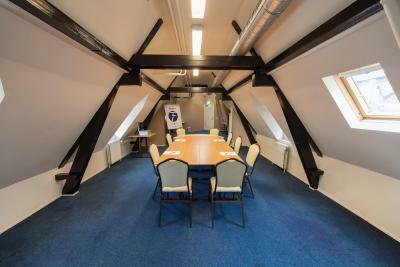 De ligging in Deventer, prachtig pand! 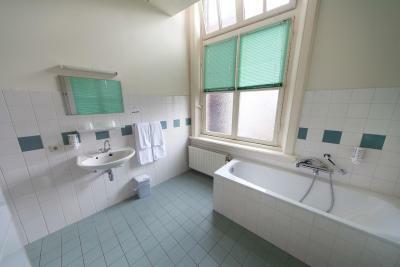 Bathroom needs renovating with additions of hairdryer, magnifying mirror and shower cubicle ( instead of clinging curtain!) Water tepid and low pressure. Bar/lounge- service on request so dont sit waiting! Nothing really. An English language channel on the TV- BBC - would have been nice but it's a minor thing. Beautiful building right in the heart of town in the central pedestrian precinct. I had no car with me but there is paid parking nearby. Staff very friendly and the room was clean and comfortable. No hotel restaurant but there are plenty of places to eat in town and the breakfast was fine. It's a 3 star hotel so it's simple, but I would certainly use it again. Price/quality balance is very good. Room at the street side was very noisy at night with a constant stream of party goers going home with loud voices. Parking only in public garages if you have a car, but they do make that clear upfront so not a real complaint about that. Room could have been pre heated. It was a litte cold until it had warmed up afer I turned the radiator on. It was fine after that. Just very good quality all round. Wonderful location. No tea or coffee requirements in room. The stairs were a bit much, 50 of them, by the end of our stay. Excellent value for money for my single room, which included breakfast (which was good). Good location not too far from the station and very close to the town centre, but in a very quiet street. As other people have written, it is a beautiful building.